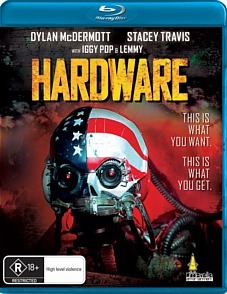 Hardware Blu-ray Review. It’s raw, disturbing and engaging at the same time- an underrated classic that deserves to move forward in your consciousness. Hardware is a perfect candidate for the label of ‘Cult classic.’ Low budget, not a massive hit at the box office, it never quite entered the broader public consciousness the way that other cyborg franchise, starring Arnold what‘s-his-face, did. Maybe it was too obscure, too violent or too raunchy to be appreciated by cinema-goers. But this is a movie that was always going to attract a following; it has a story pulled from the pages of 2000 AD (Just like Judge Dredd if you’re still in the dark.) It has an eclectic and energetic soundtrack, including Ministry and Motorhead. It has Iggy Pop as a zealous radio announcer. It boasts some truly inspired writing, direction and lighting effects, and in my opinion it’s a cut above James Cameron’s first robot-fest. Hardware is set on a future planet Earth, although it looks more like Mars thanks to a protracted nuclear bombardment. Most of the world’s population is crammed into a few giant cities, the only habitable places left, and one particular government is trying to convince its citizens to give up their right to procreation. Enter into this setting Moses Baxter (Dylan McDermott) a wandering opportunist who acquires a derelict robot skull in a shady transaction. He takes the skull to his artist girlfriend Jill (Stacey Travis,) thinking that she might be able to incorporate it into her latest sculpture. Eventually the robot, actually a Mark 13 combat model, comes back to life, and re-assembles itself from the junk in Jill’s apartment. Now fully aware and on the rampage, the droid sets out to trap Jill in her home and to kill any would-be rescuers. The deep, seedy voice of the narrator in the film’s trailer wants you to believe that this is standard early nineties horror/action schlock, and emphasizes the sexual depravity and the excessive violence on offer. While those things are there, they’re not the main drawcard. Perhaps if Hardware had been marketed slightly better upon its release, we’d be seeing it on a lot more Sci-fi/ horror top ten lists today. The thing that makes this movie is the believability of its world, coupled with the personality of its characters. A lot of care and effort has gone into the construction of the various sets, and they’re really tipped over the edge by some crazy lighting effects. While the film’s antagonist is menacing enough in his own right, the tension owes more to the powerful synthetic soundtrack and some clever editing than any robotic wizardry. The first part of the movie crawls at a snail’s pace, and then it suddenly explodes in a frenzy of sound, colour and violence. When one particular character dies, the movie stops being a horror and takes on operatic overtones- it’s surreal, insane and transfixing all at once. I first watched this movie on a battered old VHS tape from my local video store, and I was concerned that the transition to Blu-ray might make the picture look too crisp and clean. While you can see the sweat drip out of every pore on the actors’ faces, there is still some graininess to the picture, which only enhances its personality. The soundtrack has scrubbed up nicely, and sounds super-sharp. As well as the standard commentary, trailer and deleted scenes, this Blu-ray comes packed with a handful of other short works by Director Richard Stanley. The image and sound quality is very low in most of these, and they don’t bear much relevance to the main feature- it’s best to give them a miss. They say it’s a fine line between madness and genius. In Hardware, you’re never quite sure what side of the line you’re on. It’s raw, disturbing and engaging at the same time- an underrated classic that deserves to move forward in your consciousness.